This is a new visualisation of what the Fylde Coast could look like if Cuadrilla’s plans to build up to a hundred well pads in their licence area PEDL165 went ahead, revised after they relinquished a mere 63 sq km of their 1180 sq km licence area this year. Which was no loss to them as it was under the Bowland AONB and would have been nigh-impossible to frack. Last year Cuadrilla’s Well Services Director (at the time), Eric Vaughan, confirmed in the June 2015 issue of “In Focus” magazine Cuadrilla’s intention, if they moved ahead to full production phase, to aim for between 80 and 100 wellpads in their licence area, and at no time since have Cuadrilla denied this or announced new plans. We believe it is important that the consequences of this ambition are understood, and we produced a map showing the potential density of wellpads across the licence area. Although the map is illustrative only, it has a firm rationale based on Cuadrilla’s own figures, which they have repeatedly quoted to promote the idea that shale gas would bring economic benefit. The 100 well pad scenario, with forty wells per pad, has been repeatedly used to promote the supposed economic benefits of fracking, as in the Cuadrilla-sponsored report for the Institute of Directors report Getting Shale Gas Working and the UKOOG industry-commissioned Ernst and Young report Getting Ready For Shale Gas. These reports are the basis for the push by the Cuadrilla and Centrica sponsored North West Energy Task Force to promote the idea that Lancashire and the Fylde in particular will benefit from shale development. This was clearly designed to influence the councillors and their decisions on two Cuadrilla applications in 2015. Whilst the councillors may not have taken any such hypothetical future full-scale production scenario into account in coming to a decision on a single exploratory site, it is unavoidable that the millions being spent by Cuadrilla on promotion of production benefits were intended to have some effect. Alan Tootill said: “We have excluded urban areas as not being frackable, and the relinquished area. That leaves us with something over 900 square kilometers for 100 pads. This sounds a lot, but it means there would have to be a grid of pads only about 3 kilometers apart – less than two miles. Our estimates for Cuaadrilla’s wellpad density are entirely consistent with statements by other prospective shale gas operators. 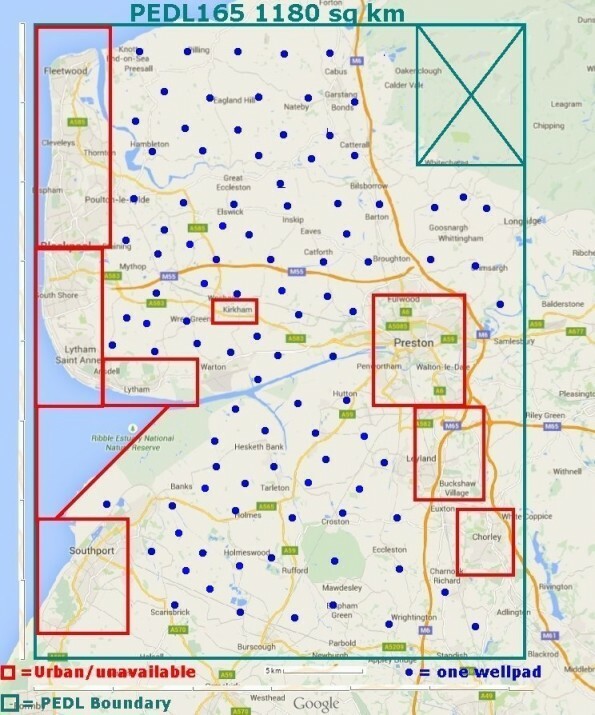 The indicated wellpad density of around ten pads per 100 sq km has been repeated recently by INEOS in detailing their plans for Yorkshire, Cheshire and their Lancashire licence areas. How much energy security would such a plan bring? Over twenty or thirty years, the estimated total gas output of an individual well is known as an Estimated Ultimately Recovery EUR figure. In the US there are varying estimates of average EUR, industry estimates tend to be higher and inflated, government estimates lower. The US Geological Survey give an estimate of all shale wells of around 1.1 billion cubic feet of gas. Cuadrilla’s report for the Institute of Directors used selected higher industry estimates from particular gasfields, stating average EUR of over 3bcf. If however we use the official US Energy Information Administration 2013 figures from all US fields these show a raw average of 1.8bcf for EUR. Should the whole of the rural Fylde suffer fracking for such a meagre reward which would not even begin to answer the UK’s perceived energy security issues? Further information can be found here; for backup to the figures here. Information on the pollution risks from 4000 wells here.